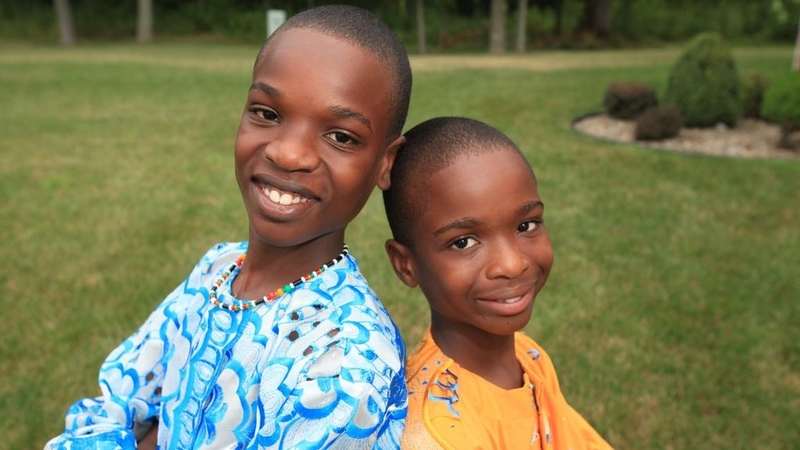 Twins Kevin and Devin wearing new African suits their parents bought them. It was unfair, an injustice for sure. All of their friends had them, but my twin nephews didn't. Not even one. And they seemed to be everywhere with other kids. At the mall. In the park. Even at school. It pained the boys deeply. So, for their 11th birthday, I passed on the iPod Touch and 3DS, and gave them what they've ached for: their mother and father. I bought us round-trip tickets to Liberia in May, making it official: Devin and Kevin would finally meet their parents. The boys would finally have their mother's nurturing, undivided attention. Finally get to feel the sense of security only their father can provide. "Finally get to be like normal kids and hang out with our Mom and Dad," Kevin cheered. Brimming with anticipation, the boys quickly laid out plans for our three weeks in the West African country. They would be "Mommy's little helpers," busy by her side, helping with meals, and tagging along to her college campus for classes. They would go to work with their father, help out with his projects and challenge him in their favorite online games. But as we neared our July 7 departure date, the boys' enthusiasm changed. "I'm nervous," Devin admitted. "I don't know my parents, and I'm shy around people I don't know." "Yeah, what if they don't like me," Kevin also worried. "I'm happy I'm going but I'm really scared. They're like strangers." My eldest sister and her husband were deported back to their native Liberia in 2001, leaving six children to be raised by different relatives in different states. The older children, then ages 10 to 18, had forged strong bonds with their parents. Obediah Boeing had been an easygoing dad who gave mischief a pass, imbued casual conversations with educational nuggets and told stories so funny, laughs would roll nonstop. Their mother, Josephine "Fatu" Boeing, was a no-nonsense disciplinarian who'll check the first sign of bad behavior, but also a hard-working mother driven to enrich her children's lives with everything her childhood lacked. Her dazzling smile would miraculously soften her stoic demeanor. But Devin and Kevin had no such memories of their parents. Fraternal twins, they were 10 months old when their parents were sent away. It was Grandma who fed them spoons of mashed peas in their high chairs, signed off on field trips and made sure they were in church every Sunday. And it was I, "Aunty Emma," who celebrated their birthdays at Chuck E. Cheese's, bought their first tennis rackets and dashed out of the newsroom many evenings to snag a seat at their school performances -- Devin playing the saxophone at Transit Middle School's concerts and Kevin belting carols with Country Parkway's chorus. Devin was the first to spot the woman in the African suit and jean jacket, running across Roberts International Airport's parking lot. Fatu's speed was hindered by her mermaid-styled skirt. But her sons, who had been drained by our 20-hour journey, sprinted with fresh legs. Devin jumped in her arms and Kevin followed. Fatu stumbled backward, nearly toppled by the tandem tackle and emotions. "My babies!" she cried and laughed. "Oh my God, my babies. I can't believe it." Amid the hugs, Fatu dabbed her eyes with a white handkerchief, and Devin took in his mother. "Wow, this boy looks just like Fatu," had been spoken to him so many times by his mother's family that he wanted to know if it was true. He scanned her face. She was essentially a younger version of Grandma, with a slightly different nose. But her mocha complexion, lips and eyes -- with the same long, full eyelashes -- were all Devin. "I do look like her! I can actually see the resemblance," he thought. Their father, trailing from parking the car, caught up and stayed collected until the twins shrieked "Dad!" and pinned him with embraces. Obediah's eyes welled. "After all these years apart, they called me 'Dad,' " he said. "I thought they would be withdrawn but they were so happy to see us. I was so touched." Kevin, teary eyed, looked up at his father's face. "I have his smile," he said. "I have his smile." Kevin had heard the endless remarks about Devin taking after their mother, but there was no consensus on his looks, and he didn't have any close-up photos of his father. Now, he said, "I'm so happy to know I look like somebody." Obediah and Fatu kept up with their children with regular phone calls and through annual school, birthday and holiday pictures. But photos can only tell so much. "Kevin, what happened?" Obediah asked as he gave him a good look over. "Your 'younger' brother is so much taller than you. What's going on? And you look so young. You're just a little boy. In your pictures you look so grown." Kevin, the gregarious and playful twin, is 12 minutes older but 6 inches shorter than Devin, who's more introspective and shy. Strangers often take Devin to be Kevin's older brother, not his twin. "I don't know what's going on," Kevin said. "Devin won't stop growing. I'll catch him soon." The hourlong ride from the airport to the house was an introduction to Liberia, Africa's first independent republic. Established by an American Colonization Society and the government for freed blacks, the country was on the mend, recovering from a series of civil wars. But the battle scars from 14 years of combat were everywhere: the absence of streetlights as evening dawned, the shoddy zinc and mud shacks that served as homes, and the children desperately hawking snacks in ruthless traffic. Mango, palm and other tropical trees lined Roberts Field Highway. Unmanicured foliage made for a blotchy but lush landscape. Women in colorful lappas strolled the sides of the road, toting tubs of bananas and coconuts on their heads, and barefoot children, legs smacked with dust, played makeshift soccer with goals made of tree branches. Liberian life flashed by, but Devin and Kevin missed it, sitting in the back seat, engrossed in Fatu. "Oh, but y'all really can't stop looking at me, ehn?" she joked in Liberian English. "That's because y'all don't know your mother. But don't worry, y'all will get to know her." We bounced in our seats, as the Corolla dipped in and out of craters along the muddy, unpaved dirt road. And then it climbed up to the neat, white concrete house with large patches of grass. Word of "American children coming" had permeated the Barnersville community, and a crush of youngsters filled the yard. Devin and Kevin beamed at the sight of potential playmates; they also noticed their ragged T-shirts. And unlike their friends in Williamsville, these children weren't clutching hand-held games or sporting MP3 ear buds. "They're really poor," Devin concluded. We hauled our hefty suitcases through the crowd and their whispers, loud from excitement, of "Y'all come see, that they American children them, oh!" "They coming from America, oh!" Devin and Kevin were giddy from their newfound celebrity. It's customary to welcome visitors with livestock, and Obediah got the boys a goat. They named it Billy, fed it leaves and spoiled it with candy and doughnuts. "It's like the dog we always wanted," Kevin said. And they treated it so, walking the goat daily, forgetting it was slated for a future dinner. Fatu had cooked rice and pepper soup, a spicy broth with chunks of fish. But before the boys had their first taste of their mom's cooking, Obediah led a prayer, thanking God for our safe arrival and the reunion. And then, there were formal introductions and explanations. "Devin and Kevin, you guys did not drop out of the sky, you came from somewhere," he told them. "And this woman and I are the source, the vehicle you two used to come to this earth. "We did not abandon you two. A series of unfortunate events separated us." He explained how, when the family lived in Toldeo, Ohio, their rented house caught fire. Although it had been plagued with gas leaks, and the couple had reported one that morning, they were charged with arson, convicted and ordered to pay restitution. There was no jail time ordered. "I still can't believe it," Fatu said. "I still can't believe our world got turned upside down for something we didn't do." They had no money to appeal the verdict, and didn't realize that their felony conviction meant deportation. INS officials arrested my sister and her husband at their jobs; among the six children left at home were their newborn twin sons. At the deportation hearing, Obediah, then 42, explained how their lives would be in danger in because Liberia was still embroiled in the brutal conflict. And my sister, then 34, cried through her testimony of being raped during the war. When the judge nevertheless ordered them to be returned to the war-ravaged country they had fled years earlier, Fatu and Obediah decided their children would remain in America. I was 24 then; and my 10-year-old nephew and 12-year-old niece moved to Buffalo to live with me. My sister's two stepchildren, then 15 and 18, were in Charlotte, N.C., with my cousin and aunt. "They are y'all children now," Obediah said after they signed off on guardianship. In Liberia, one of the poorest countries in the world, my sister and her husband are not struggling. Fatu, now 44, is pursuing a degree at the University of Liberia. Obediah is among the 15 percent of Liberians who are formally employed, with an office job. While their needs are met, they long for their children. Raised in a culture where motherhood defines a woman, my sister feels stripped of that prized title. "It hurts to see other people with their children," Fatu admitted. "It's made me withdrawn, sometimes I just stay in my room. I don't want to go among people; I don't want to talk to anybody." Devin and Kevin didn't know what happened to their parents. Grandma didn't tell them. But strangers far away, called "Mom" and "Dad," phoned them often. "At first I thought they went out of town or something, and we were just staying with Grandma," Devin recalled. "But then when they didn't come to get us, we started calling Grandma 'Mom.'" "But she told us she was our grandmother and our mother was in Africa," Kevin added. In kindergarten, where his classmates were escorted to class by their mothers and fathers, Devin arrived every morning with Uncle Roosevelt. Mother's Day and Father's Day are especially painful. "I hate those times of the year because we have to make cards, and I always tell my teachers my parents aren't here," Kevin said. "But they still make me make the cards for Grandma." I've also been the reluctant recipient of several of those "Happy Mother's Day, Aunty Emma" art projects, even receiving a Father's Day card last year from a frustrated Kevin. I understood his hurt. My father died during the war; I last saw him when I was 7. I knew we had to go to Liberia. Twenty-two days, of course, couldn't make up for the 10 years lost but it's a good start, my sister said when I confirmed our visit. "I'm so happy my children are coming." The series of Liberian civil wars took 250,000 lives, displaced 750,000 and decimated the country's economy and infrastructure, leaving it without electricity and piped water. "We don't have a refrigerator, a microwave or a stove," my sister said to prepare us. "We cook with coal pots." Also, the country runs on generators. The sound of crickets were drowned by the hum of my sister's unit, which was gassed up at sundown, injecting life into cell phones and laptops as they receive their daily charge. With no refrigerator, Fatu traveled to the market every day. Fresh fish and just picked vegetables gave Liberian favorites, like palm butter and rice, bold flavors. "Everything taste so much better," Devin noted. "The fish is so soft." Cooking in Liberia is taxing. Water has to be drawn from a well or a pump. Coals are needed for the coal pot, which is then fanned to stoke the fire. But Fatu gladly made last-minute runs for ingredients and whipped up fried okra, plantains chips and other dishes. She toted buckets of water for their baths and arose at dawn to do laundry on a washboard. "I feel like a mother again," she said. "All these things are the things I'm supposed to do for my children. And it's been wonderful getting a chance to do them." As babies, Kevin clung to his mother and would wail when she couldn't hold him. But Devin, once fed, was content playing by himself. In Liberia, similar scenes played out. Kevin woke up every morning in a panic: "Where's my mom? Where did she go?" Devin would be sprawled in the bed, listening to his MP3 player. Their parents also remember baby Kevin's tendency to tug at Devin's hair and clothes the minute he got near him. And in Liberia, Fatu and Obediah noticed Kevin's habit of picking fights with his brother. "It started when they were babies," Obediah said. With no working traffic lights, Liberia's roadways heaved with real danger. And at bustling Broad and Gurley streets, where we stood, disaster seemed imminent. As yellow taxis and motorcycles bolted through the intersection, Fatu and Obediah's parental instincts kicked in. They extended their hands to Devin and Kevin. The gesture was monumental for the boys. But the whole "mother-and-father" thing was still new -- they've only been in Liberia for a day. As Kevin's right hand slowly stretched up to his father's and Devin's left hand moved in on his mother's, disbelief and elation zoomed through them, and then, jitters set in. But after years of envying other kids, hand-locked with their parents, Devin and Kevin couldn't resist a chance at that loving clutch. So on that afternoon, my nephews held their parents' hands for the first time in their memory as they raced across Broad Street and maneuvered crammed sidewalks, hand-in-hand with their parents. "I felt closer to her," Devin said. "I really felt like I was with my dad," Kevin said. It was the first of many firsts to come. The twins accompanied their mother to campus, sitting outside of classrooms as she presented final projects and took tests. Obediah let them visit his office, where they might wind up elbowing one another to use the computer. "My dad's job is so cool because he works in a big building and he has a really nice office, and we get to go on the Internet," Kevin said. After our first week, Kevin asked, "Why can't I stay here with you guys?" Although Liberia is gradually rebuilding, its has a long way to go. "Of course, we want them here with us, but they have better opportunities in America," Fatu said. In Liberia, the official language is English, but Liberian English -- a feverish pidgin with borrowed phrases from the American South mixed with the syntax and rhythmic intonation of the nation's indigenous languages. But Devin and Kevin only spoke American English, so conversation with their new Liberian friends was hindered. "Eh, I'an understand that thing you talking, oh." So the twins started using Liberian phrases, like "My man, you feecee, oh!" But their accents were off, inciting laughter among their friends, but communication was improved. Our three weeks wrapped up with a bang -- Liberia's Independence Day. After a road trip to serene Blue Lake in rural Bomi County, the twins' goat was that evening's special dinner -- fufu with a flavorful soup with chunks of meat so tender the boys didn't make the connection. At sunset, kids converged for football (although the twins called it soccer at first), where the boys who dominated matches in their Williamsville neighborhood, were outplayed by their new friends' more aggressive and athletic styles. And then, it was time to go home. Roberts International Airport permits only passengers in the terminals. The twins gave their parents quick hugs and dragged their luggage behind them. My sister and brother-in-law were composed. "We'll see you guys soon," Fatu said as we went through the entrance. "God will make a way." On the plane, I asked if they were OK.
"I'm sad but I can handle it," Devin said. "I'm not sad-sad," Kevin said. "I feel happy inside because I saw my parents." "I feel whole," Devin said. "I feel complete."